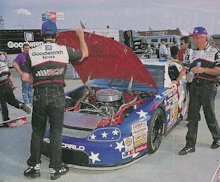 The silver paint scheme of 1995 was so popular, that in 1996, RCR again gave its Chevy a special look for the Winston Select. The stars and stripes of the U.S. flag were painted on the car to support the U.S. Olympics that were to be held in Atlanta that summer. The trend was catching on. A few weeks later, Ken Schrader's car was also given a special Olympic paint scheme. Rusty Wallace and Terry Labonte also used special paint jobs that year. Dale Jarrett won the first 30-lap segment for a check of $50,000. Earnhardt rallied from placing 12th in the opening segment to win the second 30-lap segment. In the first lap of the segment Dale moved from eighth to fifth, and after two more laps he was up to second. Terry Labonte passed Harry Gant for first place and ran strong, only to be run down by Earnhardt with six laps to go. Earnhardt also collected a $50,000 check for his second segment win. Then came the final 10-lap shootout for the win and the big check. When the racing finally began, what people thought would happen, did. Earnhardt had Stars 'n' Stripes on the inside, Terry Labonte was on the outside; neither was backin' off. Earnhardt and Labonte were side by side (visions of last year's race) when the two cars bumped, taking them high up the banking in Turn 2. Michael Waltrip, running third, saw the opening on the inside and took it straight to victory lane. Earnhardt finished 3rd. The crew checks the car prior to the race. Before the race, teams line their cars up on the frontstretch, facing the grandstands.